— Alan Turing has received a pardon from the Queen for “moral turpitude.” A pardon? Pardon me, but Alan Turing doesn’t need any bloody pardon from anyone. The man was a genius, someone who gave great service to his country. He was not only a brilliant mathamatician but the father of computing and inventor of the machine that broke the Nazi Enigma code in WWII, a feat which some people believe won the war (for my own take on that see my essay on the subject (http://www.amazon.com/Most-Secret-Source-Role-ULTRA-ebook/dp/B00ADE30TQ). No, Alan, stand proud, you don’t need no pardon from anyone! — Justin Bieber…. yawn, just go away, will you please? You’ve become the Britney Spears of your generation. If only you weren’t Canadian so you didn’t infect the world’s opinion of our fine country. — The Sochi Olympics; in a previous post, I mused whether the Olympics were worth the money and resource in this age; with the irresistible target they make for terrorists, that opinion is only growing stronger. I pray for the athletes, their relatives and the specator’s sakes there is somehow no incident related to these games. — Rob Ford….see comments about la Bieber above but replace Britney Spears with Marion Barry. To paraphrase an axiom, a city gets the mayor it deserves. Toronto the unloved. — Gillian Flynn…I recently finished two extremely disturbing novels by Madame Flynn. So well written but so soul destoying; after reading them, I felt like scrubbing out my soul with a wire brush… do I applaud her skills or lament the psychological trauma the books inflict? In contrast, I also finished Christopher Moore’s LAMB, comically rich and just as well written. How is that people object to this satire of the Messiah story so much more strongly than Madame Flynn’s rampage through the psyche? — The Ukraine….deja Orange…my prayers are with you. Prompted by a friend’s recent Facebook posting, I decided to link this article up here. It was originally published in the Kingston Whig newspaper on July 29, 2006. Outside, it is night. Inside, too. The hour of lead. You’re awake, but not happy to be; alive, but not thrilled about that either; dark thoughts swirling around your head, the spool of your wasted life rewinding on a loop, the days creeping over you like a shroud, the urges to die and get better mixed in you like blueberries in a pancake. Everything with the taste of nothing; life a four letter word. Happy? Forget it. Other people’s realities are too much; your own, not enough. You’re not living, you’re resisting. You might as well be a clump of salt left over after being spread on the 401. Happy is fatuous, like a helium balloon. Happy belongs to vapid commercials about bland families smiling Crest-white teeth in the suburbs, marveling over a new brand of processed cheese that sprays out of cans. Happy is for other people in other worlds. You, you’re just a mouse on a wheel, with no pleasure coming into the cycle at any point, a barbed wire fence around your feelings, an inner scratching that announces worse is yet to come. The pain never goes away. It just moves around. 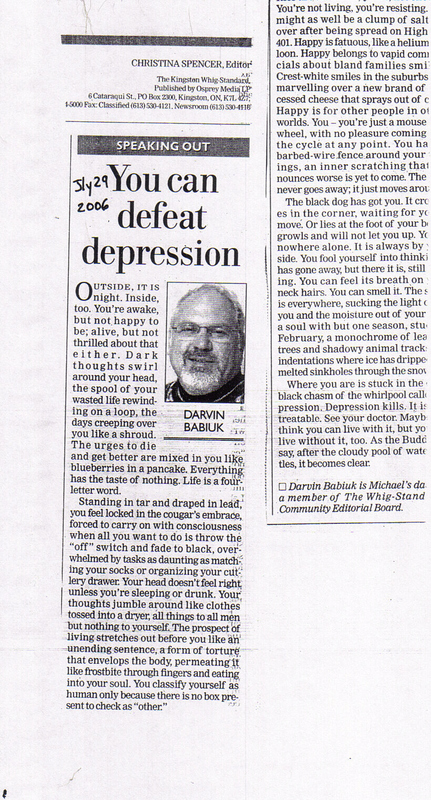 The black dog has got you. It crouches in the corner, waiting for you to move. Or lies at the foot of your bed. Growls and will not let you up. You go nowhere alone. It is always by your side. You fool yourself into thinking it has gone away, but there it is, still lurking. You can feel its breath on your neck hairs. Smell it. The spoor is everywhere, sucking the light out of you and wicking the moisture out of your soul; a soul with but one season, stuck in February, a monochrome of leafless trees and shadowy animal tracks and indentations where ice has dripped and melted sinkholes through the snow. Where you are is stuck in the deep, black chasm of the whirlpool called Depression. Depression kills. It is also treatable. See your doctor. Maybe you think you can live with it, but you can live without it, too. As the Buddhists say, after the cloudy pool of water settles, it becomes clear. The Sochi Olympics are coming soon, just a matter of a few weeks now. The dedication and training athletes put in is amazing just to qualify for the Games, much less actually win them. It is truly something to admire, the accomplishments these athletes achieve just to reach the competition level. Having said that, and putting aside the scandals regarding pharmaceutical help and medical cheating, are the modern games worth it anymore? The resources needed to stage the games and provide security in this day and age for a 2- or 3-week event is prodigous. Would the finances and work be better spent on other social needs in the host countries? I was lucky enough to be living in Vancouver during the last Winter Olympics and the spirit and atmosphere was amazing. I’m not sure, however, if I wouldn’t rather see something more mundane but more worthwhile (food banks? soup kitchens? treatment programs for the East End denizens?) receive the resources. What do you think? I get it. Anyone who can rise through talent and dedication to play professional sports in any capacity has to be respected. Their accomplishment is one 99% can never reach. Having said that, which athlete below is the ultimate “one-hit wonder,” one who reached dizzying heights, never to rise to the same level again? A terrible new drug your own parents are taking right now! There a lot of crappy TV shows that just go on year after year after year. Contrarily, some really good shows don’t make it past their first year. Which one-season TV show do you think was the best of the bunch and would liked to have seen more of?